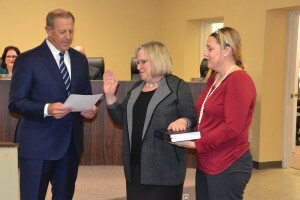 When asked why she was interested in serving on Cherry Hill Township Council, newly appointed Councilwoman Carolyn Jacobs’ answer was short, simple and full of pride. Jacobs was chosen as the newest member of council during last Monday’s reorganization meeting. Council chose her to fill the seat of Councilwoman Susan Shin Angulo, who resigned at the end of 2015 after being elected to the Camden County Board of Chosen Freeholders. Jacobs will fill the seat for the remainder of 2016. A special election will be held in November to fill the remaining year of the term. Jacobs is a long-time resident of Cherry Hill, having lived in the Point of Woods neighborhood for the past 43 years. In that time, she’s seen the township change in many ways. What hasn’t changed, however, has been her love for the community. Jacobs and her late husband Eric were involved in Cherry Hill for a number of years. Eric served as chief of staff and township administrator under former mayors Art Simons and Bernie Platt. Carolyn got started in public service in the 1990s, when she served on the planning board during Susan Bass Levin’s term as mayor. Jacobs served a number of years on the board before stepping down due to conflicts with her career. Prior to retirement in 2011, Jacobs worked as a programming, project and account-management professional and consultant. After retiring, Jacobs was ready to begin serving the township again. “When Mayor (Chuck) Cahn became mayor, I went to him and said ‘Chuck, I would love to be back on planning board,’” she said. Jacobs has been on the planning board since 2012 and will continue to serve on the board as council’s Class III representative. Jacobs was one of three candidates the Cherry Hill Democratic Committee nominated for the seat. Council President Dave Fleisher said Jacobs was not only chosen because of her experience on planning board, but also because of her service as a volunteer in South Jersey. Jacobs serves as a volunteer court-appointed special advocate for children who have been removed from homes due to neglect or abuse. She also reads to at-risk children as part of the Bookmates literacy program and serves as a member of Temple Beth Sholom’s board of directors. “Carolyn has worked in various capacities to make Cherry Hill and our region a better, stronger place to live and work,” Fleisher said. Jacobs’ impact on the community was evident at her swearing-in ceremony. While she had invited a few friends and family members to join her, she was surprised to see how many community members came just to congratulate her.